Jeb Bush and Marco Rubio have some fundamental things in common: They're both Republicans, they're both experienced politicians, they both speak Spanish, and they're both from Florida. In fact, it might have been safe to say that Bush and Rubio were friends. But now they have something else in common, too: They're both running for president — and it seems like their campaigns are putting a damper on their friendship. At the start of their campaigns, I'll admit that I had hoped for a Bush-Rubio ticket come 2016 (yes, in that order). I'm still hopeful, but it seems less likely with each passing day. It seems even less likely that their names would appear in that order, as Rubio rises in the polls and Bush falters. Throughout the race, Bush and Rubio haven't made it a secret that they're friendly. Rubio welcomed his "friend" Bush into the race back in June when the latter was set to make his official announcement. Just last week, Bush called Rubio his friend at a campaign event in New Hampshire. But it's the other things they've said along the way — particularly things that Bush has said lately — that should make us think twice about the current state of their friendship. The roots of the Bush-Rubio friendship can be traced back to 1998, when Rubio was running a grassroots campaign for a spot on the West Miami City Commission. That was also the year Bush would win his first term as Florida governor. During his campaign, Rubio received an unexpected donation: a $50 check from Bush. According to a friend, Rubio couldn't stop showing it off. Rubio won his election — and a powerful mentor. Over the next several years, both Rubio's and Bush's political careers grew. By 2005, Rubio was elected speaker of the Florida House of Representatives and Bush was serving his second term as governor. At this point, Bush offered resounding praises for Rubio, passing on a symbolic sword from his family to Rubio and calling him a "great conservative warrior." As a great conservative warrior, Rubio continued to advance his political career. In 2010, he won his first term in the U.S. Senate, although he wouldn't have run if Bush had wanted the job for himself. When Bush passed on the opportunity to run, he instead took a backseat role in supporting Rubio's campaign, and he even attended Rubio's election watch party to celebrate with him on election night. Often in the Senate, when faced with a tough choice, I ask myself: WWJD. What would Jeb do? He has more experience than Barack Obama had when he ran, more practical experience. In politics, people throw around the word "friend" so much it often has little real meaning. This is not one of those times. When I call Jeb Bush my friend, I mean he is someone I like, care for and respect. He and I have worked closely together for many years, on issues big and small. He is a passionate advocate for what he believes, and I welcome him to the race. Can I bring something up here? Because I am a constituent of the senator and I helped him and I expected he would do constituent service, which means that he show up to work. Rubio instantly fired back that Bush only called attention to his Senate attendance because they are competing for the same job. This incident seemed like somewhat of a turning point in their friendship. It's as if they've decided that they can't afford to play nice anymore, even despite their friendship. Do you get paid when you don't show up? I mean, come on. Does anybody in this room get paid when they decide, oh, well, I'm going to go do something else? For his part, Rubio has said that he won't take to attacking Bush because that's not how he wants to campaign. At the end of the day, whether they're friends or not, Bush and Rubio are both adults and they're both on the same side. 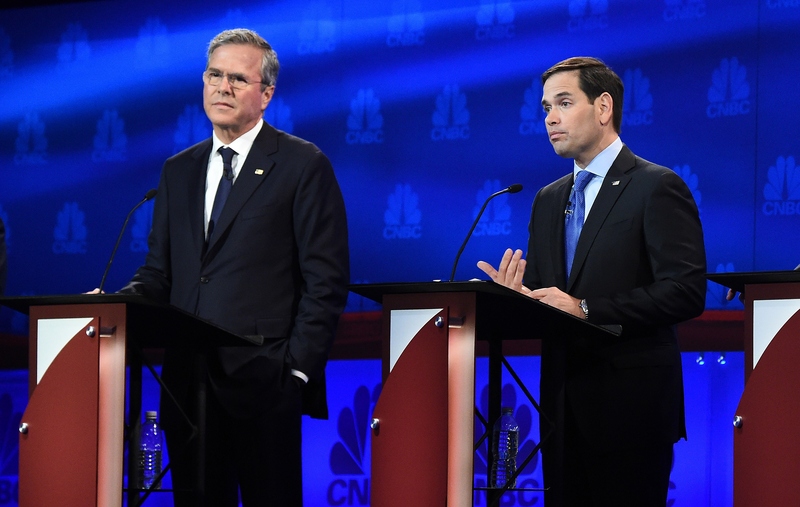 Will we see a Bush-Rubio ticket? Maybe not. Will Bush and Rubio ever hang out again? Probably. Let's face it, if they always got their feelings hurt that easily, they probably wouldn't be in politics.